On The Daily Show last night, host Jon Stewart dug into the recent rise in so-called "religious freedom" bills that would, contrary to how they are depicted by their advocates, enshrine into law a person's right to discriminate against LGBT people. Stewart skewered every aspect of the right's most recent backlash to the spread of marriage equality. Stewart quipped that this new spate of legislation is really about "protecting the real victims of discrimination", that is to say Christian florists, a group "who gladly do business with all manner of divorced, non mother and father honoring, covetous, name of the Lord in vein taking adulterers." Everyone, that is, except a gay couple wanting a pair of boutonnieres. And what about the names for some of these anti-gay laws, like Arkansas' "Intrastate Commerce Improvement Act"? Apparently the "Against Gross Gay People Act" was a little too obvious. 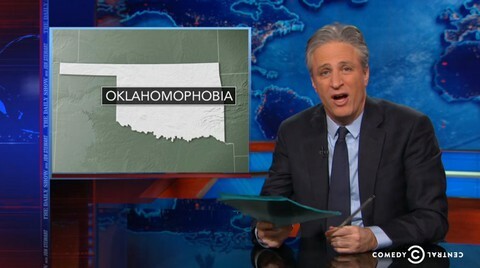 Meanwhile, Oklahoma is looking to replace a civil institution, marriage, with a religious one. A practice that is know in some parts of the world as sharia law, as Stewart points out. And as for the right's uproar over which bathroom transgender people must use? As Stewart says, "nothing says limited government like micro-managing transgender bathroom use."